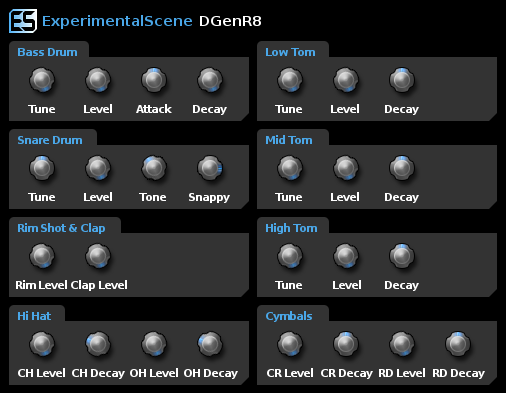 ES DGenR8 is an open source, virtual analog drum machine in the style of Roland's TR Series, in particular the Roland TR-909, with 11 voices and controls that mimic the TR-909: Bass Drum, Snare Drum, Low, Mid & High Toms, Rim Shot, Clap, Open & Closed Hi Hats, Crash & Ride Cymbals. Fixed A Bug In DGenR8 VST Which Caused The VST Host To Crash When The Amount Of Samples Processed Per Block Were Changed By The Host. Ported To Visual C++ 2010 Express. Restored SSE2 (Streaming Single Instruction Multiple Data Extensions) Optimizations. New Artwork For Graphical Interface. Updated In Line With DarkWave Studio v3.4.3.